Originated in the Cades Cove area of the Great Smoky Mountains National Park in Tennessee. Named for Herbert Myers who says it makes the best cider he ever tasted. 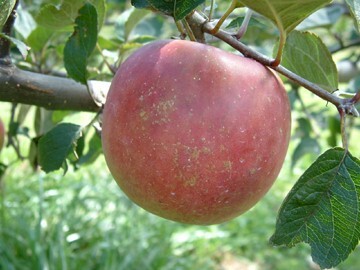 Large, deep red and yellow apple with a distinctive flavor. A juicy, firm, aromatic apple which makes wonderful cider. Strong, vigorous tree with weeping growth habit. Am very interested in growing this apple. Are there any still for sale from fall 2013? We certainly wish we had a few extra trees in stock for you but, unfortunately, we sold out of Myer’s Royal late last fall. 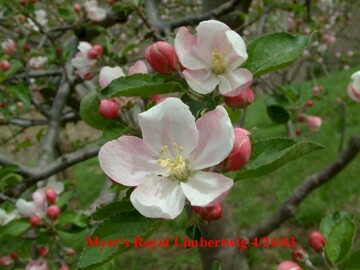 This, like most Limbertwig’s, are very popular apples and the trees tend to sell quickly in the fall. We will be grafting a lot of Myer’s Royal this spring and would be pleased to custom-graft a couple for delivery to you in the fall. If interested, just send us your request, along with your shipping address and telephone number, and we’ll be delighted to put together a couple of nice, healthy trees for you. Contact us any time if you have any questions. Do you have royal limber twig trees for sale? If so, how much and when would they be shipped?